Create an incredibly like-new sharp edge with this electric multi-stage knife sharpener. Safe for use with high-quality knives, the unit can restore a 15-degree edge for Asian-style knives and a 20-degree edge for European- and American-style knives. It can also sharpen fine-edge or serrated blades, sports knives, pocketknives, and Santuko and traditional Japanese-style single-bevel edges, including the thicker Deba-style blades, as well as double-bevel blades. Its three-stage system produces a perfect edge. Precise knife guides automatically position the knife for foolproof operation, while 100-percent diamond abrasives and patented flexible stropping and polishing discs sharpen, hone, and deliver a microscopically polished edge. Other highlights include a simple on/off switch, stabilizing feet, and durable construction. Assembled in the USA, the knife sharpener measures 12 by 6-1/5 by 6-2/5-inch and carries a three-year limited warranty. 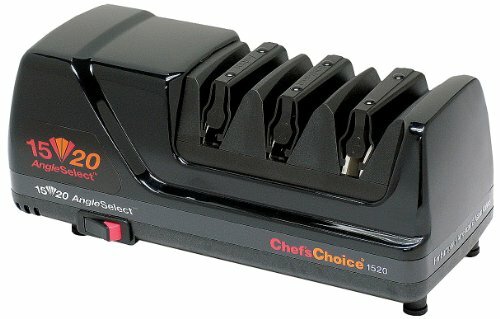 The Chef's Choice 1520 Angle Select Diamond Hone Sharpener, Black, 120Volts-60HZ, 125W. For household use only. Product is manufactured for North American electrical standards and is intended for use in the United States and Canada.